I have gone all in on the CA - I’ve moved over all my Direct Debits, Salary and use it for all of my day to day spending. Only time I use my legacy account (with Lloyds) is paying in cash/cheques, and the PrePaid card is only used when people use monzo.me payments. I must be uniquely unusual in never having used monzo.me. Awesome thanks @tristan. Is this post app merge? Is this post app merge? Let me buy you a coffee. Pay John instantly by tapping the link. I use the CA in the same way as the prepaid card and it occurs to me all of the analytics are basically worthless to me because of that - my spends are my spends and It is there to be blown. At the moment because there are no real incentives and it still seems a bit buggy, I don’t plan to use it as my main current account and I’m not seen anything at present that would make me switch. Out of interest which bugs have you found? I haven’t personally found any and I use it as my main current account! I got debited twice for cash from an ATM - a day apart but the same transaction. They refunded me quickly and said it was a problem on their side. Even if it wasn’t buggy, there isn’t any financial incentive to switch. there isn’t any financial incentive to switch. Whilst I completely agree in some aspects, I can’t say it’s all true First and foremost, there’s no interest being gained on your balance and there’s no “£100 for signing up” bonus… Which other banks certainly do offer! 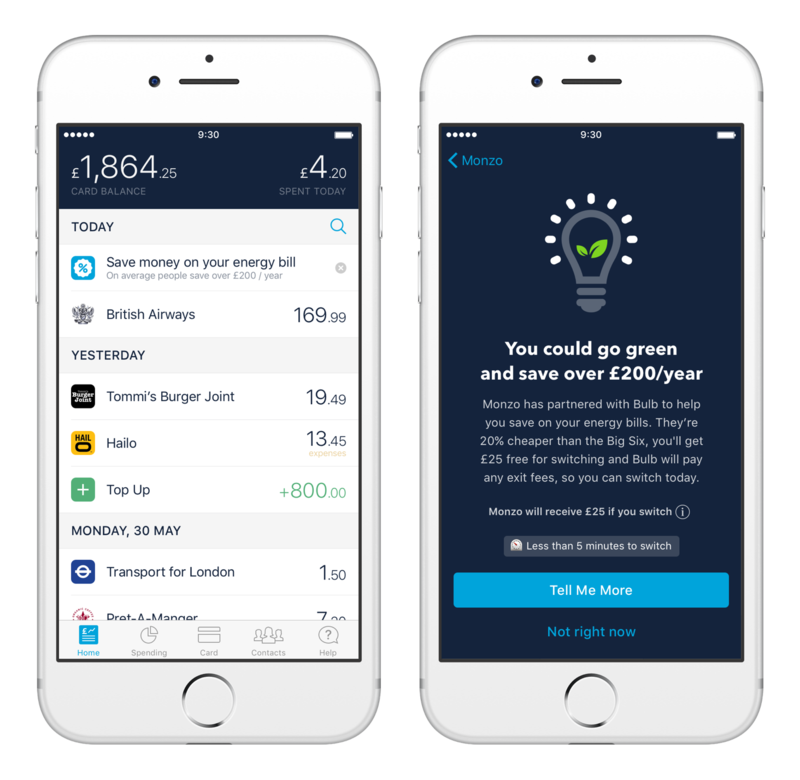 But with Monzo’s future vision of banking, there’s a lot of financial incentive on the table. We’re testing a new feature that allows people to switch energy suppliers in five minutes. Even if it wasn’t buggy, there isn’t any financial incentive to switch. I understand the ‘no financial incentive to swtich’, but buggy? I’ve yet to find bugs. The financial incentive to switch is quite interesting. I’m finding a similar effect to when I start watching my electricity usage… because I was able to monitor it I changed my behaviour without really being aware of it. Being constantly aware of my balance means I haven’t been spending the same things, but I’m just not aware of actually changing my behaviour at all… so my wages are due in a few days and I have… HOW MUCH?? left? Beers for everyone! so my wages are due in a few days and I have… HOW MUCH?? left? Beers for everyone! I have the complete opposite! I agree with this, I am so much more aware of the money I have and the money I have spent using Monzo, and thats not changed migrating to the CA.